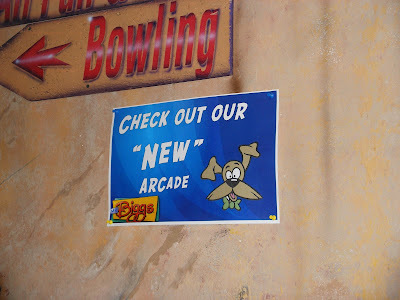 Katie writes, "I think this arcade featured all the hottest games, like PacMan and Donkey Kong. The kids probably think it's the bee's knees." The sign could have been put up just after their renonvation. Right after they put on a coat paint and rearranged the machines. Are any video arcades new anymore, except maybe in the Third World?